Never feed a bear. It's dangerous and it's against the law. New Jersey is home to all kinds of beautiful wildlife - including black bears. Black bears are getting a lot of attention these days, for the wrong reasons. They're venturing too close to homes and into backyards, looking for food. Bears that look for food near your home or in your yard likely have learned bad habits from people who feed them intentionally, or unintentionally by carelessly leaving out food or garbage. People who feed bears think they're helping them. But it only invites trouble. It can make them a nuisance or even aggressive. When that happens, the bears must be destroyed to protect your family and your neighbors. What's more, it's illegal to feed bears in New Jersey. Anyone who feeds bears could face a penalty of up to $1,000 for each offense. Taking steps to avoid attracting bears with food or garbage is the best way to prevent them from becoming a nuisance near your home. Use bear-proof garbage containers, if possible. They offer the best protection. Otherwise, store all garbage in airtight containers and place them along the inside walls of your garage, or in the basement, a sturdy shed or other secure area. Wash garbage containers with disinfectant solution at least once a week to remove odors. Draping rags soaked in bleach over your garbage bags also help to eliminate odors. Feed dogs and cats outside during daylight hours only. Immediately after feeding pets, remove all uneaten food and scraps as well as food bowls. Clean outdoor grills thoroughly after each use. Grease and food residue will attract bears. Feed birds only between December 1 and April 1 when bears are least active. Suspend birdfeeders from a free-hanging wire, making sure the bottom of the feeder is at least 10 feet off the ground. Clean up spilled seeds and shells. Pick up any fruit that falls from fruit trees daily, and discard it in your airtight garbage containers. Consider installing electric fencing to protect crops, beehives and small livestock, if you live in an area with a large black bear population. Report black bear damage or nuisance behavior to your local police department or the New Jersey Department of Environmental Protection's Division of Fish and Wildlife at (908) 735-8793. 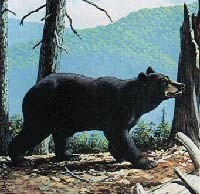 Visit http://www.njfishandwildlife.com/bearinfo.htm for more information on black bears.